Learn how you can conduct advanced searches and filter your results for date and source types by watching the two minute video on the left. 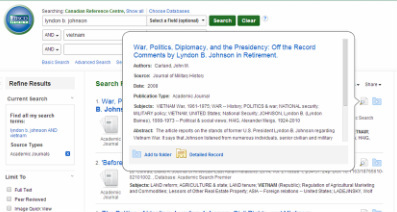 The search conducted in this video is for the database called Academic Search Premier, one of several available through EBSCO. Notes are provided below. Use the Advanced Search box to start your search. 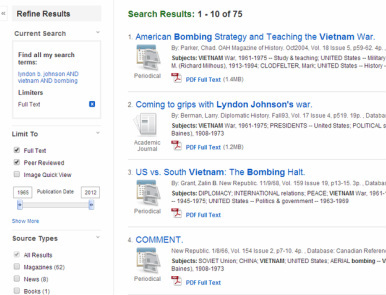 In this case, the search begins with Lyndon Johnson AND Vietnam AND bombing. Once you have a list of results, select appropriate filters. Find the filters on the left under the title "Refine Results." The search to the left has been filtered for full text. You can check by looking under the title "Currrent Search." Next go to "Limit To." "Full Text" and "Peer Reviewed" are checked here. If you want to find an article published in the time period of the epoch you are studying, move the "Publication Date" slider. Note under "Source Types," you can select magazines, news, journals, and a number of other source types. Hover your mouse over the icon with the magnifying glass to ﻿read the abstract ﻿of the article. This will save you time because the abstract provides a summary of what the article is about.